This is NOT meant to be a commentary on the spiritual state of people who love wedding planning and are fully invested in it. I have found spirituality in far too many unlikely places to think that weddings are completely devoid of it. This is only my subjective experience. To those who have been through the process of a South Asian wedding, they know it’s never as simple as: “It’s your wedding, you should do it your way.” There are people to engage, norms to follow, and expectations to fulfill. It’s about something much bigger than you. So the onus is on the couple to honour their parents’ wishes and ways of going about things. Plus, I acknowledge the importance of a milestone event like this. It sets clear in everyone’s (including the couple’s) minds that a transition is taking place, and it’s a big deal. Is puking rainbows supposed to be a good thing? I’m doing it all the time and it doesn’t feel so good. 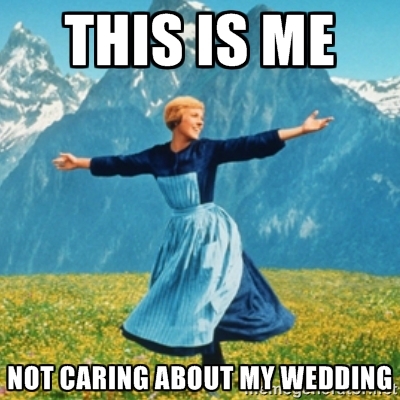 In short, I’m not the nicest person when I am wedding planning or doing any of the above things. Just like the woman who wrote the vent “My big day? Yeah right…”, my bridezilla flares up, but not because things are not turning out as I want them to. Rather, it’s because I have to undertake an endeavor I couldn’t be less interested in undertaking. Since I got engaged, most people I am surrounded by can be divided into two camps: those who wish me well and then continue talking to me as they always have, (thank you, bestie) and those who think I spend my evenings and weekends contemplating the event from every angle. The latter folks always end up giving me loads of unsolicited advice (an experience also bemoaned by a fellow writer in her piece “Bad bridal priorities”). Just…why? I won’t linger over any decisions for longer than I have to. I know that I’ll be equally happy on the day whether or not the décor or dress turn out as I’d like them to. Why spend time fussing over the details? I’ll focus on planning something else to take the focus away from wedding planning–honeymoon planning, for instance. I won’t bring it up with people (which I don’t) and try to change the subject if anyone else brings it up with me (which I could do better at). I’ll continue life as normal and enjoy the usual old stuff and new stuff like cooking and skating, since life will continue long after that day is done. I’ll plan and look forward to my marriage: from financial planning to brushing up my cooking skills to enjoying the growing bond I have with my fiance. I’ll practice mindfulness and remember death, for it’s a bigger challenge to do that when life is treating one well. May Allah save us from weddings being nothing more than a money-sucking plight. Last weekend, I went to a Sivananda Yoga camp in Val Morin, Quebec. Sivananda has several yoga centres over the world, and a handful of ashrams: secluded environments where aspiring yogis or drop-in guests enact the yogic lifestyle on a full-time basis, whether it be for a few days, a week, or several years. I don’t practice yoga, although I’ve dabbled in it throughout the years. I ended up going to this camp because a friend of mine had visited their ashram in the Bahamas and spoke very positively of it, telling me that by no means does one have to be a hard-core yogi to attend. I also liked what I read about Sivananda: the founding principles of this worldwide organization is that of peace and harmony and respect for everyone’s respective faiths. More than anything, I really loved the idea of yoga being something you uphold in all aspects of your life, no just for an hour prancing on a designer mat in the gym. So I signed up. 6:00 am: Satsang – a period consisting of 30-minute silent meditation, devotional chanting, and a brief talk on yogic principles. 10:45 am: Karma Yoga (selfless service) – a brief period where guests help out with the upkeep of the ashram. 3:00 pm: Free time: I usually explored the area, said my prayers, or visited their sauna. I was surprised at the effect of the place on me. Two hours of yoga class whizzed by, whereas in my day-to-day life I have difficulty sparing half an hour for any sort of exercise. I experienced no longing for caffeine. It helped that everyone there was so friendly, that we were in the mountains where I devoured lungfuls of fresh air, and that the food was lacto-vegetarian, ayurvedic, and delicious. A recipe for healing…my own mini-Eat, Pray, Love, one could say! There were plenty of moments of loneliness and confusion throughout my stay. At times, I was bewildered at myself for being there, and a part of me demanded justification. I had to do a great deal of self coaching and telling myself to just remain with the present. One of the highlights of my stay was praying in nature, on top of a high-mounted deck usually used for yoga class. I can do fajr. I’ve had a lifelong battle to pray the pre-dawn prayer on time. I’ve always had difficulty either waking up, or (more often) going back to sleep afterwards. Given the awkwardness of fajr time–especially in the summer months–this meant that I neglected to wake up for it. I was dictated by my body’s need for sleep. Seeing everyone up at dawn for satsang was inspiring and motivating for me in a novel way. It is not just my mind, but my body, my habit, that knows: It is normal to wake up and spend some time in spiritual activity. Not waking up for fajr is keeping me from being the best I can be. It can no longer be so. I am now trying to get better at waking up for fajr, and even if I end up with less sleep, it doesn’t bother me the way it used to. I absorb myself in my salaat. My salaat is my primary meditation. I’m a “doer,” someone who is happiest in the midst of activity and movement. So sitting meditation is not well-suited for me. It’s still worth practicing, but my priority will be being mindful of my salaat. There were a series of instructions given to us gently prior to our meditation session: to deepen our breathing, to acknowledge any distracting thoughts and simply bring the mind back, to recite a mantra to ourselves internally if need be. These are all instructions I reflexively offer myself prior to starting one of my five daily prayers. I don’t just dive in with takbeer: I take a moment to ground myself and acknowledge that I am beginning a sacred act. Housework is karma yoga. Karma yoga refers to volunteering in a selfless, spirited manner, without any dislike for the act. In the ashram setting, it was a way to make guests a part of the ashram. In my case, it was fairly small-scale work: helping set up for the workshop and sweeping the front entrance, neither of which took more than fifteen minutes. (I think they start you off easy to not be off-putting.) Doing those activities and seeing the hustle and bustle of the full-time volunteers cooking and cleaning filled me with love for this type of yoga. It is me, because, again, I am a doer. No wonder it is thought to obliterate one’s selfishness! Witnessing karma yoga in the yoga camp showed me the kind of loving attitude required in one’s housework. Since I came back, such work has felt less like a drag and more of an opportunity to be mindful, to know that one’s actions mean something. I will make an effort to recite the Quran out loud as often as possible. A kirtan was an impressive thing to observe, but for me personally it did not contain the positive energy and vibrations everyone referred to. However, I knew what they were talking about when they referred to positive energy and vibrations, for I feel the same when reciting or hearing the Quran read out loud. Just like there is special virtue in reciting chants in Sanskrit, there is virtue in reciting the Quran in its revealed Arabic. In both traditions, there is an emphasis on the benefits and power of these frequent recitations, even if one does not understand the meaning of what they are saying. Brunch was the best. They made their own bread, and it was heavenly. I am not my thoughts or my emotions. This is a lesson I learned from a talk delivered during my first Satsang session. The speaker gave us an explanation for the role of the ashram and the human spirit. “Your mind is like a vinyl record,” she said. “Every thought, feeling, and action you have creates a groove in that record. The more you repeat it, the deeper that groove gets.” Boring as the ashram’s routine may seem to some, she said, following it is the process of creating new grooves, filled with positive action and energy. Focusing on deepening those “good” grooves means letting go of old patterns of negative thinking and behaviour. The more I think about the ashram–both in theory and in my lived experience–the more I realize how much I learned about willpower, personal restraint, and inner peace. It has given me a blueprint for continuing life as a Muslim, no matter what happens ahead. Something’s kicked in, and my lifestyle, intention, and outlook are visibly improving, for the better. Waiting for the spring planting. A couple of karma yogis were doing outdoor work all day. fullness be unto all; prosperity be unto all. May all be free from disabilities! May all look to the good of others! May none suffer from sorrow! The last 40 days held the expected and the unexpected. I’ll admit, the first two weeks felt less like writer’s a vow of silence and more like a vacation. It just felt so good to have one less thing to do. My mind would start composing, but I would stop myself and focus on something else. Yes, there were times I gazed blankly into the distance. But maybe my mind needed those moments to detox. Maybe it’s these blank, dull moments of emptiness that I was craving. My father recently retired from his permanent position. When it became official, he felt a strange sense of disembodiment at not having to check and respond to emails. In a similar fashion, I suppose, my writerly self felt like a phantom limb. Knowing that I could not write, even if I wanted to, I could only ignore the twitches and move on to reading, to work, to dhikr. It was towards the end that I truly felt a sense of emptiness and began to long to come back. I guess the muscle has weakened. As I write this, for example, the words are not flowing as they used to. But that is all right. Better to start from scratch. Not everything that can be said needs to be said. This is something I already referred to in my previous two posts, but experiencing the truth of the statement by refraining from writing took it to a new level. If a thought comes to me and I have the urge to express it, I’m better off waiting to see if it recurs a couple of more times before I try developing it in written form. There is so much to listen to, both in person and by reading. One of the seven effective habits is to seek first to understand, then be understood. Now that I look back at this period of silence, I can definitely see a decrease in the number of occasions where I interrupted people with my own take on a situation. So written silence did end up influencing my habits in speaking. Man, writing that was tiring! But my system has definitely reset itself, and I’m primed for a joyous, creative 2014, InshAllah. Wishing all of you a wonderful one, with thanks for your continued support! I am now conscious of words the way I started becoming conscious of animal products about a year ago. They feel heavy on my system. I’m sensitive to excess. They make me feel uneasy, the way something might feel if it’s makruh. At first I thought the solution was silence from speaking*, and I tried it for a few days. It was not without its benefits. I realized how much I talk over my sister. I slept better. My prayers and meditation deepened. However, I also realized that my spoken words do not hold a candle to my internal dialogue. When I talk over people, I feel as though my head is going to explode from everything I have to convey. I have over twenty unfinished blogposts. I write long, detailed emails that don’t necessarily meander, but they delve into so much detail that writing them exhausts me. In my spoken speech, on the other hand, I suddenly go on tangents, causing others to look at me quizzically. Every conversation is a matter of trying to catch the slippery fish of my thoughts. And then there are the worst symptoms: I haven’t finished a book in months. I would start a thread of supplications, and then forget I was doing it halfway. To sum it up: I am constantly in a state of writerly rehearsal, thinking of thing after thing to write about, to say. There was a time when I would have loved to have this problem. But this immense gift of barakah in writing goes hand-in-hand with the necessity to keep listening, keep reading. If I don’t uphold the latter two, I am no longer fit to receive this barakah. Hence all the symptoms. And so I declare my writerly vow of silence for the next forty days, so that I may to purge myself of internal writing oriented dialogue. There will be no drafting and publishing of blogposts. No journaling. No long emails. A conscious restraint in spoken speech. I may check into Facebook from time to time for reading purposes, but I won’t engage. Ya Allah, let a space open within me, so I may absorb more of Your Wisdom. *In two days’ time, I will publish a short (pre-drafted) post that discusses vows of silence in light of Islam. I implore you to study the religion to which you subscribe, and fight for a more robust, anti-hegemonic retelling of Islamic history. . . Familiarity with what is out there will inform our understanding of what we believe and why we believe it. There’s much more where that came from. Please read Abbas Rattani’s original piece here and a follow-up piece here. Here in Canada, if you venture outside in this increasingly chilly time of the year, you will see people’s jackets and coats adorned with poppies. November is the month of Remembrance for the Commonwealth countries, a way of honouring those who have given their lives in past and contemporary conflict. This year, the day of Ashura (the tenth of Muharram on the Islamic calendar) and Remembrance Day were just three days apart from each other. In fact, on the day of Ashura (which this year coincided on November 13th), I chaired a Toastmasters meeting for which I had to say few words about the theme of our meeting: Remembrance. The phrase that is adopted in observance of this month is “Lest We Forget.” It originates from Rudyard Kipling’s poem “Recessional.” Kipling wrote it on the occasion of Queen Victoria’s silver jubilee, which coincided with the height of the British empire in the early twentieth century. Here, Kipling’s invocation is that the empire must not lose themselves in their success. They must remember the sacrifice of, in Christian terms, their Original Saviour. As I read the passage with the rest of the group, I was struck by how easily this prayer resonated with me. Remembrance of sacrifice and the plea to not lose oneself in frivolity were one of the things that drew me to the Shia frame of thought. As the inheritors of the sect that is often represented as the tell-all narrative of Islam, it is up to Sunni Muslims to nip such tendencies at the bud. Part of that effort is recognizing the humanity within ourselves—our Hussaini hearts. There is no shortage of efforts in combing the facts of history and explaining the political nuances behind the battle of Karbala. However, no amount of such analysis can begin to compete with what Hussain’s martyrdom has done for the Muslim imagination. For “red” Shias and mindful Sunnis, ritually mourning the grandson of the Prophet must not be an end in itself, but be a reminder that we all must stand up to oppression in all its forms. It is this red Shi’ism that makes me passionate about protecting and upholding the rights of the vulnerable, particularly animals, children, the elderly, and the disabled. And remembering that no matter where I reach, I must never forget the weak, the underprivileged.